Before dusk and dawn the city cleaners drink their coffee in the canteen at the wharf. A room full of strong men in orange and black suites, on their shoulders three crosses that symbolize the municipality of Amsterdam. These men keep my city clean. When I wake up with a hangover the days after New Years Eve, Queensday, or the Gay Pride, they are up and running to swipe out the mess we leave behind. Today I join them in their ‘bike cleaning’ routine. I want to emerge myself in their practice, understand what the work of city cleaning is like, and discover a world behind the scenes of city management. 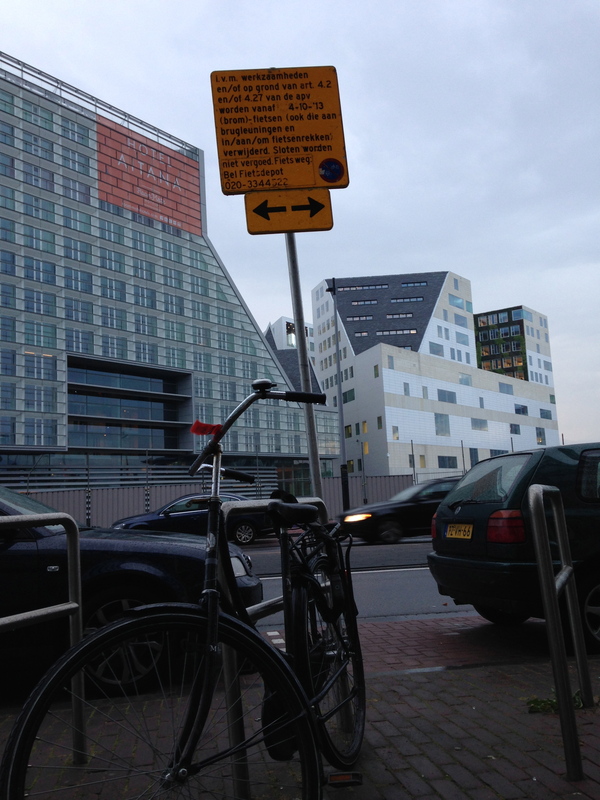 The city of Amsterdam is filled with great paradoxes but bikes are on top of many ‘Amsterdammers’ list. We love our bikes and our ability to go everywhere whenever we want. Bikes can move faster than cars in small streets, along cannels, and through little allies. But they also form a great everyday annoyance – deserted bikes take up all our parking spaces, tourists on rented bikes disrupt the city flow, people who are politely waiting for green lights block our streets, mothers with four children hanging out of their ‘container bikes’ waddle dangerously over biking paths, and others have lost all patience and scream, push, yell, even curse at all mentioned before. The manager assigned me to the team of Michael and Murat. Michael is a frivolous tall man originally from Suriname, he wears a pair of shining glasses on top of his head and invites me to the team with welcoming hand gestures. Murat, a short and squared man originally from Turkey shakes my hand and says, ‘come with me, we have to pick up the grinder first’. In turn for our team-number we get a box with an angle grinder, three batteries, and an emergency kit at a desk. In the garage the men climb on their garbage trucks and cleaning vehicles, we step into a small white truck with the city logo on the doors. Michael and Murat work together every day, usually on the same truck with the same assignment; clean the city of deserted bikes, ‘orphan bikes’ in their jargon. 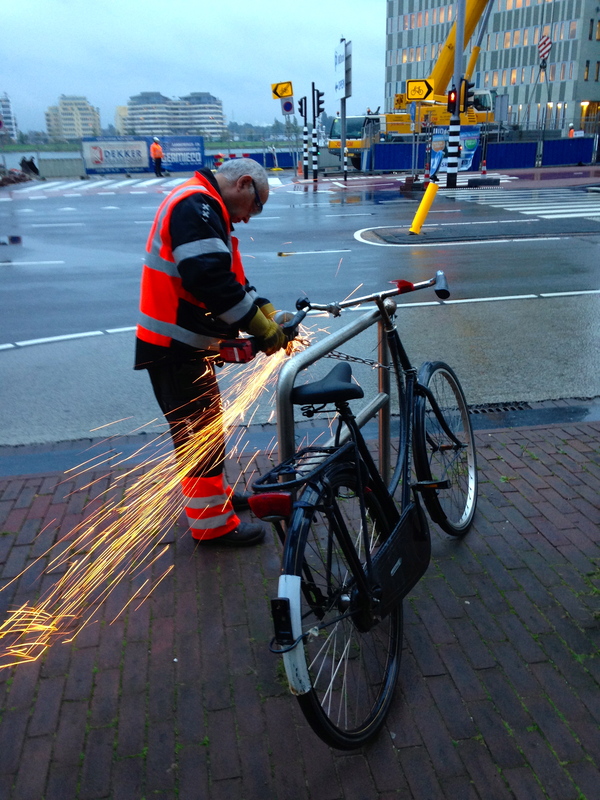 We have a special task today; we have to cut away the bikes from an area where they will start roadwork tomorrow. A sigh has put up for weeks addressing the date the work will start. When we arrive at the spot we count 10 bikes right underneath the sign. Michael takes out an Iphone with which he makes a picture of each bike and fills in all its credentials in a special system. 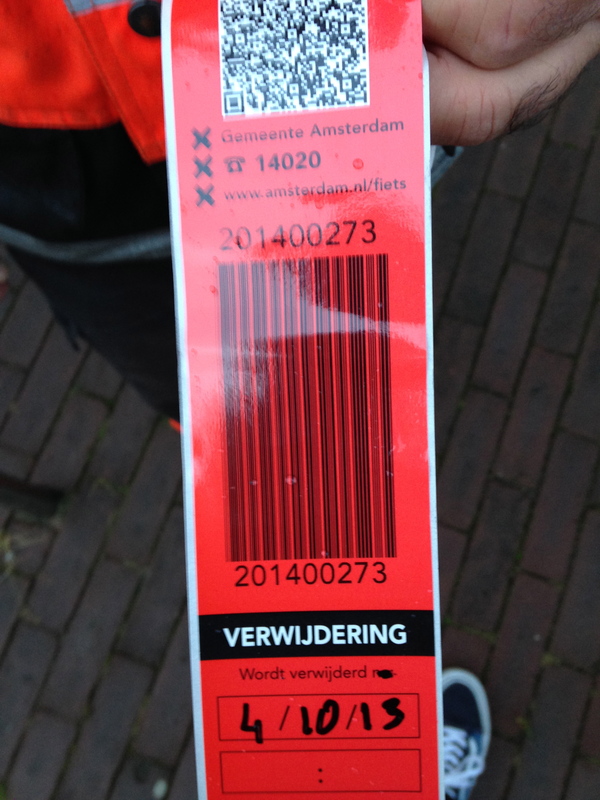 They use a red sticker with a barcode that registers the bike in the Iphone. A week before, their manager told me proudly that the central district of Amsterdam has a new system of bike accounting, a mobile system that makes it easy for people to find their bike at the ‘bike depot’ where all wrongly stalled and deserted bikes are collected. After Michael accounted for each bike Murat cuts their chains, ‘you have to think along with people, Nanke, you should cut the chain at the very end so that the person can use the expensive chain again once he picks up his bike’. Then a man comes out of his apartment, still in his PJ’s he starts screaming, ‘hey, get away from my bike!’ Murat calmly walks up to the man, ‘You cannot park here today sir, if you have a key to prove that it is yours we can erase it from the system’. Michael recollects a memory, ‘often people call us ‘bike thieves’; when they see two black guys carrying bikes on a truck they call the police. Once they did not look beyond our skin colour, they did not even see the three crosses on our shoulders. When police arrived, the anonymous caller hid insight and we just laughed all together, hahahahaha, we are civil servants!’ The man returns with his key, unlocks the broken chain, and takes his bike – that basically looks like old iron – inside. Michael deletes it from the system. 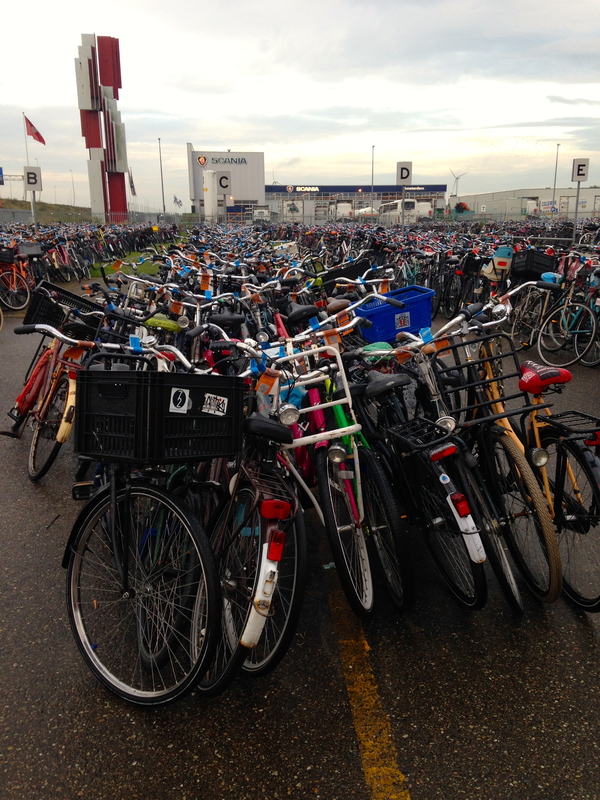 After loading the other nine bikes we drive to the ‘bike depot’, a huge terrain out of the city centre where at least a million bikes are stacked in long rows structured on alphabetic order. The super modern system fails when the bikes are handed over to the depot. Michael and Murat use a special computer to register the nine bikes, they print the credentials, and hand over the paper sheet to the depot manager. The depot uses the old system – blue stickers – thus someone else has to translate the Iphone system to the blue sticker system using the information on the print. While he is doing that, Michael, Murat, and I drink a coffee. We unload the nine bike and are off again, to our second task: ‘stickering’ and ‘tyrapping’ soon to be ‘orphan bikes’. Every day, the men are assigned to an area of the city where they give a sticker to bikes that look like orphan bikes. They introduce me to a new language with verbs like ‘stickering’ and ‘tyrapping’. They assign me to do the stickering, Murat tyraps, and Michael walks in front of us to decide which bikes look so deserted that we can grand them a sticker and a tyrap. If the sticker and the tyrap are still untouched two weeks later, they can cut of the bikes, enter all the credentials, and carry it off to the bike depot. The orphan bikes are a special category at the depot, bikes that were taken for wrong parking or roadwork are usually picked up by their owner. Orphan bikes are barely picked up. I know form experience that many tourists in Amsterdam buy a cheap stolen bike from a junky and leave it behind after the holiday. To Michael and Murat the task to relieve the city from that iron plague. We investigate every old looking bike we encounter. Michael and Murat are clearly ‘orphan bike specialists’, for a bike to become an orphan it needs to have more than two defects, the owner should not be able to jump on it and drive away. The everyday practice of these men, their language, their care for a righteous decision to depict a wreck as an orphan bike, the machinery behind the seemingly simple task of cleaning the city, I wondered, do these men get acknowledged enough for their role in the cities age old paradoxical biking quest?